Our home port of Bodrum is at the meeting point of the Aegean and Mediterranean Seas. Bodrum, ancient Halicarnassus, is one of the oldest and most attractive coastal towns of Turkey. It takes about 35-45 minutes to get from Bodrum-Milas airport to the harbor, and from Izmir airport or Dalaman airport it takes approximately 2.5 hours. The Turkish people love to call Bodrum the St.Tropez of Turkey, as in the high season Bodrum is the spot where local as well as foreign socialites relax and entertain. Bodrum’s landmark is the Castle of Saint Peter, a true Crusader Castle castle built by the Knights of Saint John in the 15th century. Today, the castle is home to the Museum of Underwater Archaeology and contains the world's most impressive collection of artifacts excavated from the many shipwrecks along the Turkish coastline, including several complete restorations of ancient ships from antiquity. We guarantee that you will be enthralled with Bodrum. You will find a variety of nightlife to choose from, including Europe's largest open air discotheque, Halikarnas. Adjacent to first class restaurants and quaint boutiques are typical local Turkish tea houses as well as many pubs, bars and cafés. East of Bodrum, the Gulf of Gökova cuts deeply into the interior of the country from west to east. The pine forest covered shores contain numerous bays, some with family owned taverns yet others completely unpopulated. Being well protected, despite all weather conditions, crystal-clear waters invite you to take a sea bath or to enjoy some snorkeling. Steady winds and moderate swells guarantee a true sailing pleasure. The Roman theater and silky beach of Cedreae and the ruins of Ceramus are both worth visiting. North-west of Bodrum, the Gulf of Güllük offers a completely different sailing area, very little traffic, fewer bays, but many small villages with little typical fishing ports and wind forces of 5 Bft. and more nearly throughout the year. Cutting approximately 25 nautical miles towards the east into Turkey's interior, the gulf offers many well protected anchoring bays, as well as the primary port of Güllük, which is mainly an industrial port and a port of entry. Kusadasi is usually the northern most port for the Blue Cruise, and is an official point of entry and exit for Greece. The Roman excavations at Ephesus are easily accessible as is what remains of the Temple of Artemis, one of the Seven Wonders of the Ancient World. Once the refuge for Saint Paul en route from Macedonia to Jerusalem, this anchorage and delightful swim stop also provides access to Miletus and Priene. Kusadasi is usually the northerern most port for the Blue Cruise, and is an official point of entry and exit for Greece. The Roman excavations at Ephesus are easily accessible as is what remains of the Temple of Artemis, one of the Seven Wonders of the Ancient World. Heading west, you’ll find yourself right in the midst of the Dodecanese Greek islands. 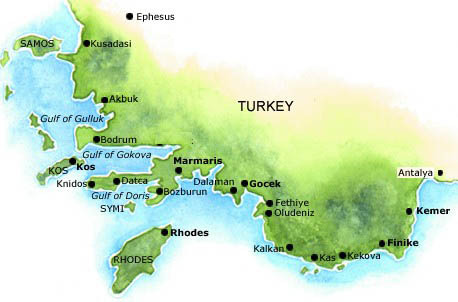 Only 10 nautical miles from Bodrum is Kos, the nearest Greek port of entry. The islands of Rhodes, Symi, Nysiros, Tilos, Astipalaya, Kalymnos, Leros and Patmos.are all possible destinations with a plethora of culinary and historical highlights. The charming picturesque village of Göcek is situated in a most lovely way in front of the mountainous scenery comprising the Gulf of Fethiye. Wharfs have been established and the promenade is very neat and well-kept. Laid-back cafes and restaurants gracefully integrate behind the harbor in beautiful surroundings and an unforgettable atmosphere. Göcek is the ideal starting point for a Blue Cruise as the transfer from Dalaman Airport is only 20 minutes. To the south lies the Gulf of Fethiye - innumerable bays, tiny islands in the midst of lush surroundings. The Gulf of Fethiye is a sailing territory with crystal-clear waters and safe bays,with excellent weather conditions to rely on. After leaving the Gulf of Fethiye you’ll discover the sandy paradise of Ölüdeniz, probably the most famous and most photographed bay in Turkey. Sailing past Seven Capes along the sandy beach of Patara with an impressive length of about 15 km, you’ll reach Kalkan and Kas, two charming, small ports. Both towns are perfect spots to start your sightseeing trip to the monuments of the ancient Lycian capital of Xanthos,the historical temple grounds of Letoon. Further to the east is Kekova. Attractions at this ancient shipyard of the same name are the historical castle, the sunken city which you can sail directly over and Kale-Ücagiz, a small and romantic village with excellent fish restaurants. From here you can visit the birthplace and church of St.Nicholas in Demre and Myra. ﻿Even further east, visit the eternal flame of Chimaerea near the Lycian city of Olympos, and continue onwards to the typically Mediterranean town of Kemer from which you can visit ancient Phaselis. Sailing north out of Fethiye or Göcek and heading northwest you’ll arrive at Ekincik bay. There you’ll have the possibility to take an enjoyable river boat excursion through a maze of reeds to reach the ancient Lycian tombs of Kaunos. Further up the delta you can indulge in a mineral mud bath, and on Iztusu Beach you can view the breeding grounds of the Caretta Caretta loggerhead turtles. Following Caunos, another destination of your journey can be the bustling Mediterranean port of Marmaris with its entire range of dining and shopping opportunities. Selimiye (ancient Hyda) is the site where one of the most important Byzantine shipwrecks dating to the 9th century was excavated. The remains of a castle serve as a stunning backdrop, and the local restaurant has been constructed with ancient stones. The anchorage of Kecibükü offers excellent swimming and is reminiscient of a fjord. Continue on to the necropolis at the Rhodian anchorage of Loryma. 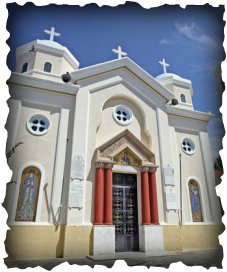 Datca is a favorite stop for stocking up on any needs and is also an official port of entry and exit in the event of continuing on to the Greek Islands. Otherwise, continue sailing to the ancient site of Knidos and finishing the cruise in Bodrum. The joy of chartering your own private gulet in Turkey is the complete freedom to do and see exactly what you wish to. From the moment of your first enquiry, our staff and crew ensure that from the time of your arrival in Turkey you will be well looked after. We take pride in implementing the holiday that you want, down to ensuring that the food and drinks you prefer are all stocked on board for you in advance.